The future of furniture might also be the future of food. Or is that the other way around? 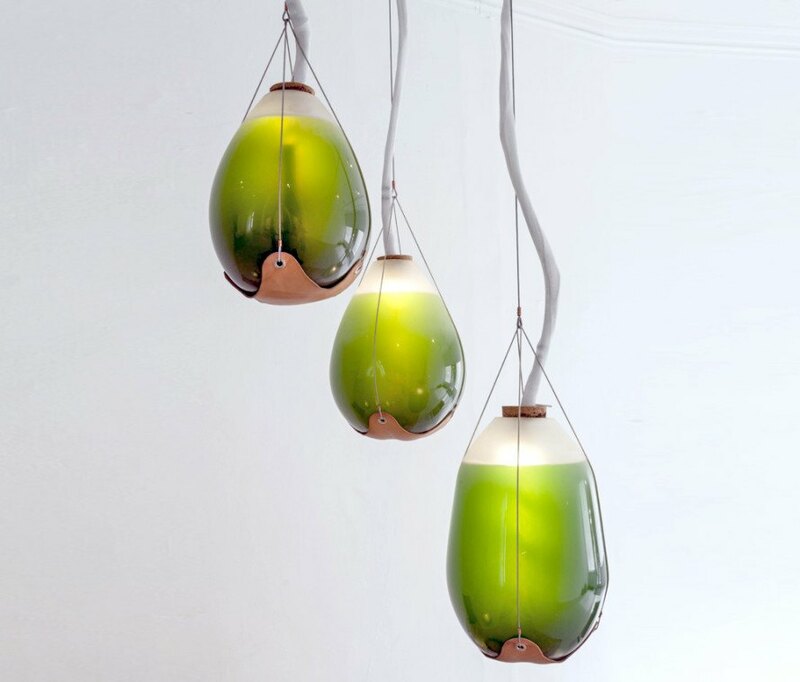 Designers are increasingly turning to microalgae, which is effectively a “liquid plant,” because it can be suspended in fluid and utilized as a design material as well as harnessed for its food production qualities. The Living Things installation is one such project, a partnership between architectural designer Jacob Douenias and industrial designer Ethan Frier, for the express purpose of creating furniture that, well, creates. 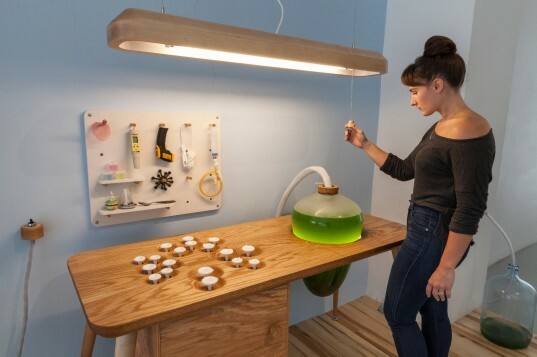 In this case, the result is photosynthetic furniture filled with tiny, edible bacteria that also function as luminous light sources. The Living Things exhibit is currently installed at The Mattress Factory, an extension of the Museum of Contemporary Art in Pittsburgh, Pennsylvania. In the furniture created by Douenias and Frier, spirulina is the star of the show. The bright green microalgae is already a popular nutritional supplement sold in health food stores, and it’s often touted as a superfood. As much as half of its weight is comprised of protein, making it a super-efficient food source. The installation, housed at a converted mattress factory, demonstrates how these architectural pieces can be integrated into everyday life in three vignettes. The kitchen arena seems the most logical place for food production, although the one in Living Things looks more like its other moniker, a control center. Here, a complex ‘life support system’ exists, including nearly half a mile of tubing hidden in the cabinetry. 3D-printed nylon knobs are embedded into the surface of the workstation, allowing visitors to control eighteen different valves that allow harvesting of the spirulina when it’s ready for consumption or other uses. 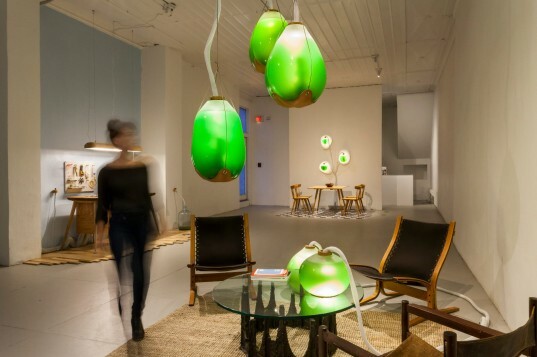 A dining set is accompanied by wall-mounted lamps filled with glowing, living spirulina. Across the room, a small conversation area invites visitors to sit in one of three low-slung chairs, allowing the soft green glow from overhead lamps to light their socialization, while larger floor lamps warm the light from beneath. For now, the Living Things exhibit exists primarily as art, intended to inspire curious minds. However, the system is functional, and it’s possible that other architectural designers could follow the lead and incorporate more living art into their work. The Living Things installation is on display at the Mattress Factory until March 2016. It's too bad we can't use these now. They are so cool. I guess though if you live in an apartment you couldn't have them installed because the tubing would have to go behind the walls??? The Living Things exhibit is currently installed at The Mattress Factory, an extension of the Museum of Contemporary Art in Pittsburgh, Pennsylvania. 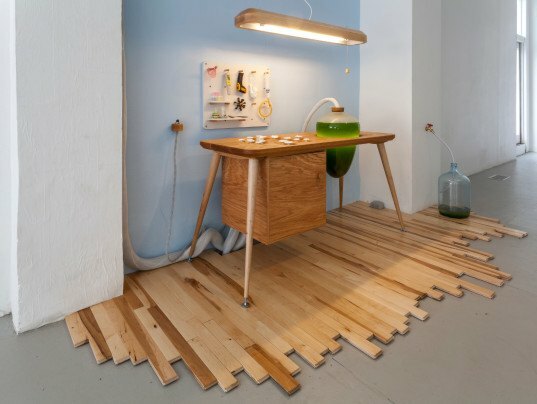 In the furniture created by Douenias and Frier, spirulina is the star of the show. The bright green microalgae is already a popular nutritional supplement sold in health food stores, and it’s often touted as a superfood. As much as half of its weight is comprised of protein, making it a super-efficient food source. The soft green glow of algae is both soothing and eerie. For now, the Living Things exhibit exists primarily as art, intended to inspire curious minds. However, the system is functional, and it’s possible that other architectural designers could follow the lead and incorporate more living art into their work.